Super Savings Item! Save 35% on the AboveTEK Universal Tablet Lock Security Cable, 2 Keys Durable Steel iPad Locking Kit w/Adhesive Anchors, Anti Theft Hardware Protection for iPhone Mobile Notebook Computer Monitor Mac Book Laptop by AboveTEK at Pacs BG. MPN: 4335260016. Hurry! Limited time offer. Offer valid only while supplies last. 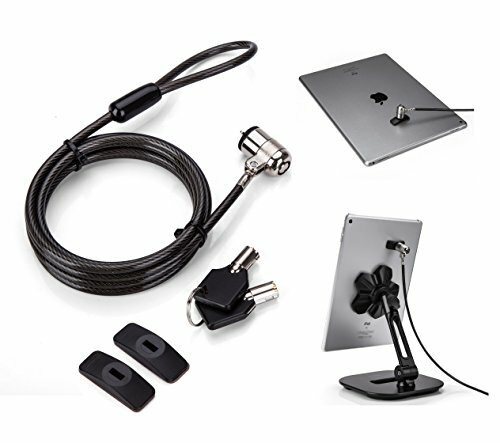 Do you want to have a simple ipad/iphone locking cable kit to pair with our AboveTEK Tablet Stand as perfect solution for an ipad anti-theft stand? Do you want to have a simple ipad/iphone locking cable kit to pair with our AboveTEK Tablet Stand as perfect solution for an ipad anti-theft stand? Do you want to lock your checkout iPad at your business commercial store so that you can focus more on customers? Do you want a key based security cable to lock the showroom display tablet at reception desk for safety? Do you want to freely walk away from your pricey desktop computer or Macbook without worrying about theft of your device? Do you rent iPad or other electronics device to students or staff and need to lock them in place for protecting the property? If you have any questions about this product by AboveTEK, contact us by completing and submitting the form below. If you are looking for a specif part number, please include it with your message.